I have been interested in the ePaper technology for a while. I do travel on a regular basis for my job, and the majority of these trips are on flights over 4 hours. In addition that that, I really like reading books (when time permits). One of the biggest problems I normally have when I travel is that I am in the middle of a book with normally 150 pages to go… this means that I will be done reading it before my plane lands at its destination. So the only option for myself is to take a second book with me. As I already carry a lot of “stuff” when I travel, I was looking for a way to avoid this. The other thing that is part of my job is to read documents such as analysts reports or white paper, usually in PDF or RTF format. 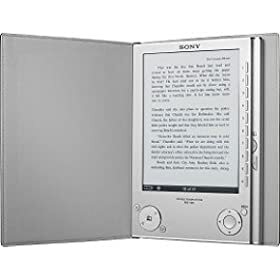 The Sony eBook Reader is supposed to support these formats, as well as Microsoft Word (but no Corel WordPerfect) and MP3 files for music and audiobooks. More on this later. To stay true with Sony, the software that comes with the eReader only works on Windows. But the great news with this new version of the device is that you can simply drag&drop documents to the internal memory or to the memory cards through a USB connection and they will automatically get added to your available books. Even better, in addition to the expected Memory Stick format, the PRS-505 also has an SD Memory slot! Yes, I know, Sony supporting something else that their own format. And the other good news is that this device charges itself through USB! No need for a separate charger when traveling. When it comes to openness, the PRS-505 can display RTF, DOC and unencrypted PDF files directly. This is great in theory, up to the point where you try to display a PDF document formatted for US Letter or A4 (e.g. the size of most of the PDF files). They look really bad on the Sony eReader. One work-around is to set the device in Landscape mode, but even then, the quality is not good enough to be readable. Sony recommends to re-generate the PDF according to their specifications to solve this problem! As if I could contact Forester to get this done… I haven’t noticed this problem with RTFs as the device is able to reflow the text to better match the screen. Sony could have supported the Mobile PDF specs and give the option to the user to either display the PDF in its original formatting or optimize the document for ePaper reading, but they did not. For those of you who have a similar problem, here is my solution: Use Corel WordPerfect’s PDF import feature. You can then save the document in RTF format and display it correctly on the eReader. When it comes to reading books, you can feel that this is not a version 1.0 product. The device is light, its aluminum finish makes it comfortable to hold in your hand and the buttons to flip pages are conveniently positioned both on the right and at the bottom of the device. You can choose your font size and bookmark pages for future reference. The ePaper technology used makes it very nice to ready long documents: Because there is no backlight required, the eyes don’t get tired very quickly (just like with normal paper) and battery life is really great. Yes, the page flipping is a little strange at first with the black flash, but I found the reading experience really nice. One thing I found out: Don’t leave the eReader connected to a computer that is in stand-by… it will drain the power of the Sony device very quickly and you will then need to recharge it. This is at least the case on my MacBook Pro. Finally, I haven’t really tried the MP3 and photo-display feature. One thing that I noticed is missing is support for Audible audiobooks. It would be great to be able to read a book or to listen to it. As Sony isn’t selling audiobooks on its online store, why not partner with Audible who is offering a great service (and of whom I already have quite a few books)… Do I really need to manually convert all these files into MP3 before I can listen to them on my eBook reader? All in all, this is a great little device. Certainly way to early for mass adoption, but it is showing the way to come. As the technology evolves, prices go down and companies think more and more about the user experience, this will become a viable experience for many of us who read a lot. The biggest problem (or advantage) is that my bookshelfs will not fill-up that quickly any more. I would love the option to buy the physical book and get the electronic copy for free as a download for when I travel. Perhaps that’s the power Amazon has over Sony when it comes to eBooks… wait and see. I haven’t tried it, but PDF2Office might be another solution that could convert PDF files into a format better suited for the Sony eReader such as RTF. Another useful link related to the Sony eBook reader is libprs500, a library management tool with converter capabilities into the Sony format. Pingback: Gerard’s CC:World » Blog Archive » How to improve eBook readers?